Oceanic islands, such as Juan Fernández in Chile, are the home for particular biotas that have evolved in isolation over a long period. The anthropogenic introduction of allochtonous plants is one of many problems for the conservation of endemic elements. In this paper, we present the new additions to the introduced flora of the Juan Fernández Islands, adding some comments about their life form, origin, morphological characteristics, ecology, distribution, abundance, and their potential of invasion. We cited 27 new species, 12 new genera, and three new families for the Juan Fernández flora (Amaryllidaceae, Commelinaceae and Violaceae). Most genera belonged to Asteraceae (seven species). Fifty-nine percent of taxa were perennial herbs, followed by annual or biennial herbs. Wind was the main vector of propagule dispersal (42 %), followed by vegetative dispersal (23 %). Fifty-two percent of the species were weeds and 44 % were plants with dual behaviour: garden-weed plant. Eurasia was the most frequent area of plant origin (70 %). Ninety-four percent of the taxa with known geographic range are in the V Region of mainland Chile, which is the main region of export of plants and materials to the archipelago, suggesting that this may have been the immediate origin of these introductions. 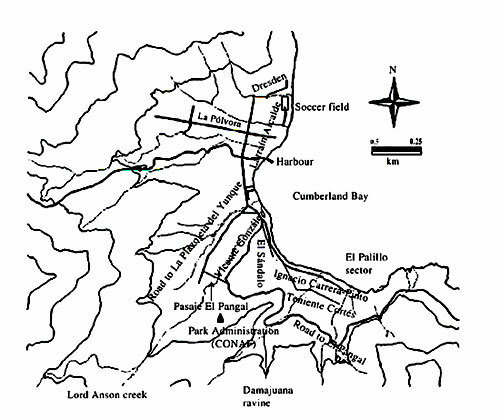 Sixty-three percent of the species were only found in the San Juan Bautista urban area, while the remaining taxa were also (22 %) or exclusively (15 %) found in other places of the main island (Robinson Crusoe). Sixteen species (59 %) are considered as noxious weeds in Juan Fernández or elsewhere, and they should be a focus of attention and, eventually, control. Summing our findings to previous lists of introduced taxa, we obtained 260 non-native taxa in Juan Fernández. This number is greater than the native taxa (211), which demonstrate how the human intentional and non-intentional action can dramatically change the floristic composition of an oceanic archipelago. We strongly recommend the installation of a sanitary control in Robinson Crusoe Island or in Valparaíso, in association with quarantine procedures with the food vegetables, and biological products in general. Key words: biological invasions, garden plants, oceanic islands, plant introductions, weeds. Las islas oceánicas, tal como Juan Fernández en Chile, albergan biotas particulares que han evolucionado aisladas por largo tiempo. La introducción por parte del hombre de plantas alóctonas es uno de los muchos problemas para la conservación de los elementos endémicos. En este artículo, presentamos nuevas adiciones a la flora introducida de las Islas Juan Fernández, agregando algunos comentarios acerca de su forma de vida, origen, características morfológicas, ecología, distribución, abundancia y su potencial de invasión. Citamos 27 nuevas especies, 12 nuevos géneros y tres nuevas familias para la flora de Juan Fernández (Amaryllidaceae, Commelinaceae y Violaceae). La mayoría de los géneros pertenecieron a Asteraceae (siete especies). Cincuenta y nueve por ciento de los taxa fueron hierbas perennes, seguidos por las hierbas anuales o bianuales. El viento fue el principal vector de dispersión (42 %), seguido por la dispersión vegetativa (23 %). Cincuenta y dos por ciento de las especies fueron malezas y 44 % fueron plantas con una conducta dual: planta de jardín-maleza. Eurasia fue el área más frecuente de origen de las plantas (70 %). Noventa y cuatro por ciento de los taxa con distribución geográfica conocida están en la V Región de Chile continental, principal región de exportación de plantas y materiales al archipiélago, sugiriendo que ésta puede haber sido el origen inmediato de estas introducciones. Sesenta y tres por ciento de las especies fueron encontradas solamente en el área urbana de San Juan Bautista, mientras que el resto fueron también (22 %) o exclusivamente (15 %) encontradas en otros lugares de la isla principal (Robinson Crusoe). Dieciséis especies (59 %) son consideradas como malezas nocivas en Juan Fernández u otras partes, y ellas debieran ser foco de atención y, eventualmente, control. Sumando nuestros hallazgos a listas previas de introducidas, obtuvimos 260 taxa no nativos en Juan Fernández. Este número es mayor que las nativas (211), lo cual demuestra cómo la acción humana intencional y no intencional puede cambiar dramáticamente la composición florística de un archipiélago oceánico. Recomendamos fuertemente la instalación de un control sanitario en la Isla Robinson Crusoe o en Valparaíso, en asociación con procedimientos de cuarentena con las plantas comestibles y productos biológicos en general. Palabras clave: invasiones biológicas, plantas de jardín, islas oceánicas, introducciones de plantas, malezas. Oceanic island biotas are tremendously vulnerable to the introduction of invasive species, regardless of species taxonomical membership (fungi, animals, plants, etc.) (Spencer & Benton 1995, Bergstrom & Chown 1999). One of the main problems with the arrival of introduced species to an island is the establishment of new biotic interactions between the alien and native species. For example, the introduction of animals has changed the patterns of browsing in New Zealand (Towns & Ballantine 1993), grazing in Australian islands (Priddel et al. 2000), and predation in the Juan Fernández archipelago (Roy et al. 1999). However, other changes are manifested more slowly, such as the case of competition between native and alien plants (Bergstrom & Chown 1999). When the invasive species exclude the native ones, significant changes in terms of community composition, structure, or ecosystem processes may occur (Cronk & Fuller 2001). Juan Fernández Islands National Park (Chile), like many other insular ecosystems in the world (Rodríguez 1993, Bergstrom & Chown 1999, Priddel et al. 2000), has experienced problems with the introduction of foreign species. The Juan Fernández Islands are widely recognized as one of the most important centers of plant endemism in the world (Hulm & Thorsell 1995) with 62.1 % of their flora being endemic to the islands (Marticorena et al. 1998). They are inhabited by 131 species, 12 genera, and one family endemic to the archipelago (Marticorena et al. 1998). The origin, mode of evolution, and identity of these taxa are also very particular (Lammers et al. 1986, Sanders et al. 1987, Valdebenito et al. 1990). Due to historical introductions of aggressive exotic species and several other human-driven disturbances, the Juan Fernández National Park is considered by the International Union for the Conservation of Nature (IUCN) as one of the most endangered parks in the world (Hulm & Thorsell 1995). Besides the evident problems caused by animal invasions (Cuevas & van Leersum 2001), main threats for endemic plant species are plant plagues. Some of the worst plagues of the world were introduced to the islands through the voluntary action of man (e.g., Aristotelia chilensis, Rubus ulmifolius, Ugni molinae; Skottsberg 1953, Greimler et al. 2002a, 2002b). The vigorous sexual and vegetative reproduction of these invasive species excludes the native vegetation (Dirnböck et al. 2003). The most recent checklist of the flora of the islands reported an adventitious flora of 212 taxa (Marticorena et al. 1998). Swenson et al. (1997) mentioned another 19 introduced species to the islands, and recently Greimler et al. (2002b) reported that of the 441 species present on the Juan Fernández Islands 232 are aliens. Despite the intense collection efforts recently performed on the islands (e.g., Swenson et al. 1997, Greimler et al. 2002b), there is an important group of species not mentioned in the above studies that, paradoxically, are easily observable in the town area (San Juan Bautista). Although these are mainly garden plants, the fact that these species were overlooked by previous botanical expeditions suggests that these species have spread very recently. With very few exceptions, the islanders gardens are not organized as in a city. Instead, they are located on disturbed sites. Moreover, the only barriers between gardens and the generally unpaved streets or roads are wood-and-wire fences. Thus, many plants have the opportunity to escape, either through sexual or asexual reproduction, to native communities and produce new invasion processes. In fact, this is the supposed cause of the propagation of some of the worst plant plagues on the main island (Robinson Crusoe). Therefore, these overlooked exotics provide an unusual opportunity to explore if there are common patterns in terms of life-history traits among these new spreading species. Several works have listed different life-history traits shown by the invasive species, which may be related with the ability to invade (e.g., Noble 1989, Rejmanek & Richardson 1996, Daehler 1998, Sakai et al. 2001, Kolar & Lodge 2001). For instance, invasive species usually have the ability to reproduce sexually and asexually, rapid growth from seedling to sexual maturity, self-compatibility, high tolerance to environmental heterogeneity, herbaceous growth habit, ability to fix-nitrogen and production of many seeds with a good dispersal ability. Among the invasive species, many are categorized as weeds: plants that compete with cultivated species, as well as those noxious for man and other animals (Matthei 1995). They can also adapt to disturbed habitats and may be ecologically aggressive (Swenson et al. 1997). In this paper we report 27 new additions to the introduced flora of the Juan Fernández Islands. In order to get some insights on the potential invasiveness of these species we addressed the following questions: what is their life form?, what is the origin of these species?, what is their present distribution within the islands and in mainland Chile?, what are their main ecological characteristics that can be related with their introduction to the islands and  most importantly  their potential for further invasion? When it was possible, we compared these variables with available information for the adventitious flora already cited for the islands. We also added some brief comments about the species morphological characteristics, which will permit that other researchers can differentiate the new introductions from other congeneric species previously reported for the islands. Our final goal was to realize an updated survey of the allochtonous flora in order to detect any possible menace to the endemic species of the islands. Juan Fernández archipelago lies in the South Pacific Ocean, between 670 and 860 km from the coast of Chile (Valparaíso). It is composed by two main islands: Robinson Crusoe, 47.9 km², 33°37 S, 78°51 W (Fig. 1), and Alejandro Selkirk, 49.5 km², 33°45 S, 80°45 W; a third, smaller island (Santa Clara, 2.2 km²), is located 1.2 km southwest from Robinson Crusoe. Fig. 1: Robinson Crusoe Island, showing the sites indicated in the text. Contour lines are every 100 m.
Isla Robinson Crusoe, mostrando los sitios indicados en el texto. Las curvas de nivel están cada 100 m.
One of us lived on Robinson Crusoe Island, the main human settlement in the archipelago (600 residents, Fig. 2), for three years. Over the course of more than 110 days of excursion throughout the island, a survey of the native (endemic and non-endemic) and introduced flora was completed (J. Cuevas unpublished data). Fig. 2: San Juan Bautista, the only town in Robinson Crusoe Island, indicating the places mentioned in the text. 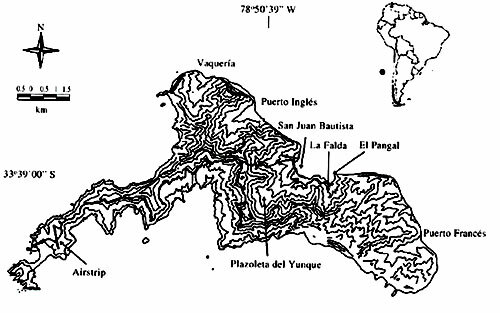 Contour lines are every 100 m.
San Juan Bautista, el único pueblo en la isla Robinson Crusoe, indicando los lugares mencionados en el texto. Las curvas de nivel están cada 100 m.
We considered a species as a new addition to the introduced flora when all the following criteria were met: (i) at least two individuals were observed growing into wild habitats, at least 1 m out of the gardens; (ii) at least one of them was sexually reproductive (in flower or fruit; if reproductive organs were missing, then we looked for field or literature evidence of vegetative reproduction); (iii) they did not require human assistance for propagation; (iv) species persisted during the whole period of observation (1999-2002), and (v) there existed evidence in the literature for the species growing into wild habitats elsewhere, being considered as a naturalized weed (e.g., escaped from cultivation or gardens, introduced, known as weed, etc., Randall 2003). Although we did not count all individuals seen in the field, and no sampling-procedure was performed, we report a visual estimation of the approximate abundance of each taxon outside gardens (2, 5, 10, ca. 50, more than 100 individuals seen), with the aim of generating a preliminary picture about the spread of these species within the islands. For each taxon, common names, life form, agronomic classification, origin, distribution in mainland Chile, and other characteristics were extracted from the literature (e.g., Ellenberg 1974, Ramírez et al. 1991, Matthei 1995, Randall 2003). Dispersal syndrome was extracted from specialized literature (e.g., van der Pijl 1969, Parsons & Cuthbertson 1992) or inferred from direct observation of propagules. Dispersal syndromes considered were: anemochory, autochory (gravity), hydrochory, epi- or endozoochory, myrmechory, and vegetative dispersal. Some taxa were categorized as weeds following the definitions of Matthei (1995) and Swenson et al. 1997 (see Introduction). Potential of invasiveness was inferred from documented cases in other places of the world (e.g., United States Department of Agriculture-Natural Resources Conservation Service 2002, Randall 2003). Additionally we considered the plant behavior in Juan Fernández, that is, if a species has spread over a short lapse, shows a relatively major abundance, or a wide distribution on the islands. Although invasiveness is a continuum from very low to very high, in the absence of more quantitative and experimental data to assess this potential, we roughly classified the species as lowly invasive or highly invasive. A species was considered as highly invasive when in the literature it has been reported as a noxious weed, principal weed, or that frequently invades natural vegetation (Swenson et al. 1997). Voucher specimens for each species were deposited in the Herbarium of the University of Concepción (CONC) and in the small herbarium located in the administration office of the Juan Fernández National Park, on Robinson Crusoe Island (JF). However, the voucher specimens are not duplicates; the collection data refer to the CONC vouchers, except when the contrary is indicated. Collection dates are indicated following the English notation (month, day, year). From an initial collection of 53 specimens, we excluded 21 taxa, which did not meet all the criteria proposed for the inclusion in our list of introduced species (see Material and Methods). Other five species were also excluded because we were not able to identify them at the species level. Therefore, we report 27 new adventitious species, 12 new genera, and three new families for the Juan Fernández flora (Amaryllidaceae, Commelinaceae and Violaceae). Overall, most genera belonged to Asteraceae (seven species). The detailed description of species life form, origin, distribution, and other characteristics can be found in the Appendix 1. Figure 3 resumes the information available for the 27 taxa reported here according to several criteria. Fifty-nine percent of the taxa are perennial herbs (including geophytes) (e.g., Alcea rosea, Amaryllis belladona) followed by annual or biennial herbs (33 %) (e.g., Cardamine hirsuta, Carduus pycnocephalus). Only two taxa are woody; one shrub and one tree, Pelargonium peltatum and Pinus pinaster, respectively (Fig. 3). Fig. 3: Profile of the new additions to the introduced flora of Juan Fernández Islands. Perfil de las nuevas adiciones a la flora introducida de las Islas Juan Fernández. Wind was the main vector of dispersal (42 %) followed by vegetative dispersal (23 %) (e.g., Oxalis pes-caprae, Leucojum vernum). Dispersal by animals was present in 19 %, including some epizoochorous species such as Erodium moschatum, myrmechorous such as Lobularia maritima, and endozoochorous such as Solanum nigrum (Fig. 3). 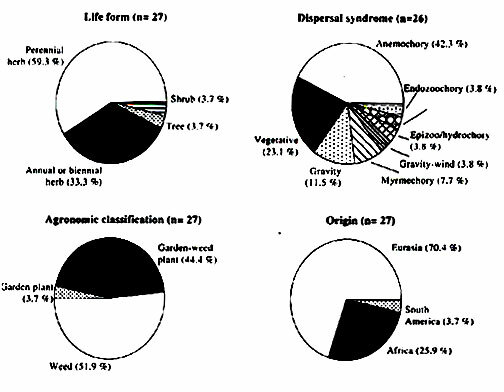 Fifty-two percent of the taxa have been considered as weeds (sensu Matthei 1995) in the agronomic literature (e.g., Parietaria judaica, Solanum nigrum), and 44 % are plants with dual behavior: garden-weed plant (e.g., Tanacetum parthenium, Viola odorata). That is, the latter plants are known as escaped from cultivation. Only 4 % were simply garden plants (Arctotis acaulis) (Fig. 3). Eurasia was the most frequent area of plant origin (70 %) (e.g., Euphorbia helioscopia, Lathyrus odoratus), followed by Africa (26 %) (e.g., Freesia refracta, Oxalis purpurea). Only one species came from South America (Tradescantia fluminensis) (Fig. 3). Although Juan Fernández is located within the V administrative region of Chile, we considered whether the introduced taxa were also present in the mainland east to the archipelago. The rationale behind this is that the principal port of Chile (Valparaíso) is the main site of exportation of supplies to Juan Fernández via cargo ships. Merchant ships travel to Robinson Crusoe and Alejandro Selkirk Islands every 45 days (Navy ships travel more sporadically) (Danton et al. 1999), transporting ca. 150 tons of food, beverage, fuel, building materials, etc. The import of garden plants has been also observed. We can also consider the air transport from Santiago, the national capital (Metropolitan Region), however the small airplanes carry scarce passengers and materials in comparison with ships (Danton et al. 1999). Occasionally, sailboats and big cruisers arrive to the islands, however they represent an even lower input of materials to the islands. We obtained information about the distribution in mainland Chile for 16 species. However, we do not have information about the distribution in the mainland for the remaining 11 species (mainly garden or garden-weed plants), as they probably are distributed only in public and private gardens and not in wild habitats. Of the 16 species with known distribution in mainland Chile, 94 % were also present in the V Region (e.g., Cardamine hirsuta, Chenopodium album). Only Anthemis arvensis has not been documented in this region yet. This suggests that the V Region could be the immediate point of introduction of these taxa to the islands. Sixty-three percent of the taxa were only found in the San Juan Bautista area (e.g., Lobularia maritima, Mentha suaveolens), while the remaining taxa were also (22 %) (e.g., Amaryllis belladona, Solanum nigrum) or exclusively (15 %) (e.g., Anthemis arvensis, Tradescantia fluminensis) found in other places, such as Puerto Inglés, Plazoleta del Yunque, Vaquería, etc. (Fig. 1). Nine species (33 %) have been reported in the literature as noxious weeds (e.g., Anthemis arvensis, Cardamine hirsuta, Oxalis pes-caprae). Thus, they can be considered as "highly invasive". Based on their rate of expansion, abundance, and wide distribution throughout the Archipelago (Appendix 1), other seven species (26 %) can be added to the category of "highly invasive": Amaryllis belladona, Carduus pycnocephalus, Erodium moschatum, Euphorbia helioscopia, Leucojum vernum, Lobularia maritima and Oxalis purpurea. Overall, 59 % of the species reported here could be expected to be potentially important as invaders. The remaining 11 species (41 %) can be classified as less invasive plants (e.g., Alcea rosea, Lathyrus odoratus). Overall, among the new introduced species reported here, the majority are herbaceous, wind dispersed, of Eurasian origin, are present in mainland Chile and reported as highly invasive in other places. It is important to note that our criteria for an inclusion in the list of introduced species were relatively strict, thus we are confident that we are not considering ephemeral species in the archipelago, or with a questionable potential for growth into wild habitats and, eventually, to expand their range. These taxa are not necessarily recently introduced species, because many may have existed on the islands for a long time. It is well known that there is a lag between the plant arrival, the first observation by local people, the observation by a botanist and, finally, the publication process. Nevertheless, it is clear that most species have spread very recently, and may become a serious threat for native biota (see Appendix 1). Most new genera belonged to Asteraceae (seven species). This result is not surprising, because it is already the most numerous family in the archipelago (Marticorena et al. 1998) and it has been considered a family with over-representation of invasive species in central Europe (Pysek et al. 1995). As it has been showed in other studies, herbaceous habit is the most frequent among the invasive species (e.g., Daehler 1998, Kolar & Lodge 2001). Considering perennial, biennial or annual herbs, we found that 93 % of species reported here were herbs. Generally herbs, which have comparatively small seeds (Baker 1972), are the most likely elements to be inadvertently introduced into a region. In contrast, exotic shrubs and trees, with greater and conspicuous seeds (Baker 1972), usually require active human assistance for their propagation. Herbs, especially annuals, also have short life cycles, rapid attainment to maturity, and propensity to self-compatibility, which is in line with the expectations of a "good" invader (Kolar & Lodge 2001). Invasive species also tend to have abiotic dispersal abilities (Daehler 1998). Among the species reported here, wind was the main vector of dispersal (42 %), and if we join this syndrome with dispersal by gravity, we concluded that 58 % of the new exotics might passively disperse their propagules. The presence of vegetative dispersal has also been considered a strategy that facilitates the invasion process (Kolar & Lodge 2001). In our case, six species can disperse vegetatively, although this syndrome seems to be a very slow way for the expansion of their ranges. Overall, 81 % of species can disperse without animal assistance, and this strategy can explain their success as recently spread invading species. The majority of the taxa reported here (52 %) have been previously considered as weeds, with some of them catalogued as "noxious" or "principal" (Matthei 1995, Randall 2003). This high percentage remarks that these species must not be underestimated as potential invaders, and should be considered in the wild flora checklists for the islands, particularly those species that seem to be aggressive invaders on Juan Fernández, which should be the focus of attention and, eventually, control. Species such as Cardamine hirsuta, Oxalis purpurea, and Amaryllis belladona were among the most abundant species with high potential invasiveness. Eurasia was the most frequent area of plant origin (70 %). This is a very striking pattern, because in the absence of human assistance, the immigration of the closer Chilean or South American species seems to be more likely. The percentage of plants of Eurasian origin reported here is similar to that reported in Matthei et al. (1993), who showed that 59-72 % of the introduced flora present on each island in 1993 was of European or Euro-Asiatic origin. In addition, 59 % of the weeds introduced throughout continental Chile are also of Euro-Asiatic origin (Matthei 1995, Arroyo et al. 2000). The predominance of Eurasian origin seems to be related with the seed dispersal by livestock migrations, as well as the culture systems employed by Euro-Asiatic man: the small seeds of cultivated species can hide other undesired weedy seeds, which permitted the joint propagation of both kinds of species. Evidently, these explanations would not be valid if Europeans had not conquered America, a phenomenon presently manifested as international trade (Matthei 1995). Although the mode of arrival of weeds is uncertain, they probably arrived inadvertently through human activities. Swenson et al. (1997) pointed out that this kind of species could be dispersed on clothing, shoes, or camping gear. We also suggest the possibility that these species have been introduced as contaminants of grass bundles, food, or even of other desired plants. Evidently, garden or garden-weed species (48 %) were introduced voluntarily by man. We found that 94 % of the taxa reported here, and with known geographic range in mainland Chile, are also present in the V Region of mainland Chile. This high percentage suggests that this may have been the immediate origin of these new exotics on the islands. If this is true, we suggest that a sanitary control should be installed in the port of Valparaíso, with the aim of impeding the introduction of exotic elements to the islands. Finally, 63 % of taxa were only found in the San Juan Bautista area, while the remaining taxa were also (22 %) or exclusively (15 %) found in other places of Robinson Crusoe. That 22 % can be interpreted as evidence of range expansion for some species such as Erodium moschatum and Cardamine hirsuta. Although the major part of the taxa listed here were found only in the town, which suggests that the invasive process is incipient, some taxa were also found elsewhere on the main island, suggesting that the invasive process has already begun. Considering the 212 introduced taxa reported by Marticorena et al. (1998), with the 19 mentioned by Swenson et al. (1997), plus two varieties cited by Matthei (1995) for Medicago polymorpha (var. brevispina and var. vulgaris), and plus our 27 taxa, we obtain 260 non-native taxa on Juan Fernández. Therefore, the number of introduced naturalized taxa is higher than the number of native taxa (211, endemic and non-endemic). These numbers give a total vascular flora for the Archipelago of 472 taxa (we added Herbertia lahue, cited by Danton et al. 1999; as the status of native or introduced species is uncertain for Herbertia, we did not count it as introduced), with 55.1 % of alien plants. This percentage of introduced taxa is remarkably high in comparison with those reported for other islands. For instance, the percentage of introduced species in the flora of Galápagos Islands is ca. 29.4 % (Tye 2001), while this percentage increases to 44 % in the Hawaii Islands (Macalipis et al. 2003). Other Chilean oceanic islands had a variable percentage of introduced flora: 5 % in San Ambrosio (Hoffmann & Marticorena 1987, see also Hoffmann & Teillier 1991), 33.3 % in San Félix (Hoffmann & Teillier 1991), and 75.2 % on Easter Island (Marticorena 1990). The lowest percentage belongs to an island with a short and sporadic human occupation (San Ambrosio, Bahamonde 1987). In contrast, the highest percentage belongs to an island inhabited by man more than 1,000 years ago (Easter Island), which has also experienced intense traffic with neighbor islands (Hoffmann & Marticorena 1987). In this regard, the 55.1 % of exotics in Juan Fernández Islands seems to be particularly high considering the recent history of human occupation (430 years). Notwithstanding, these high numbers of exotic species demonstrate how the intentional and non-intentional action of humans can change the floristic composition of oceanic archipelagos. No law forbids the introduction of plants to the islands. The only thing that the Park Administration can do in order to handle the problem is to educate people on the inconvenience of the exotic species. Although some plants do not proliferate, many are successful. Additionally, it may take a long time for the invasive character of these species to be expressed (lag phase), thus, it may be too soon to assess the success of newly introduced species. The environmental education programs that CONAF (the National Forest Service in charge of the park) conducts on Juan Fernández is one strategy that may mitigate this situation. For instance, monitors teach the 140 children of the elementary school and kindergarten about nature conservation. A manual has been specifically developed for students, focusing on the comprehension of the natural, social, and cultural environment of the islands. Moreover, pamphlets have been delivered to adults, informing them which are the plant species that they must avoid in their gardens. It is worthwhile to mention the case of the eradication of a serious potential plague (Lantana camara L.), whose presence was alerted by Stuessy et al. (1998). With the help of islanders, CONAF eliminated the scarce individuals that were found within the gardens. We must also strongly recommend that CONAF eliminate the bulbous plants found outside gardens, probably by means of mechanical methods. If they spread even more in the future, it will be impossible to do it. Such could be the case of Amaryllis, Freesia, Leucojum, and others. CONAF is also doing a good work in propagating endemic plants, which are donated to adults and children to plant in their homes. Additionally, efforts have been made to change the conscience of the people in charge of the Garden Areas of the Municipality, in order to plant native taxa through the town. Up to 80 islanders worked with CONAF between 1998 and 2003 in activities related to flora conservation: ecotourism, management of exotic tree plantations, rabbit and goat controls, plant pest control, restoration of degraded areas and in situ conservation of endangered species (Cuevas & van Leersum 2001). This work strengthens the compromise of local people for the conservation of their environment. The effect is increased if we consider that each person belongs to a five-member average family, with possibilities of interaction. Moreover, the archipelago population is strongly linked by familial ties, which further promotes the development of a common environmental conscience. The attitude of the local people has been variable in this aspect. Some people collaborate with enthusiasm in CONAF activities, giving information to the park administration when they want to introduce, or have already introduced a plant to the island. Other people prefer to conserve their gardens in spite of the claims of CONAF. Recently, the Chilean Livestock and Agriculture Service (SAG) established on Robinson Crusoe Island, with the aim of detecting and controlling some animal and plant plagues (H. González personal communication). Although we congratulate this effort, the most critical problem, the introduction of allochtonous material to the archipelago, remains without a solution. Therefore, we strongly recommend the installation of a sanitary control in Robinson Crusoe Island or Valparaíso, in association with quarantine procedures for food, vegetables and biological products in general. Finally, we stress that our list is still conservative. In the near future, many plants may propagate out from the gardens, and others will be introduced from the mainland. In this aspect, the floristic composition of Juan Fernández will be forever dynamic since no strict measures forbid the entrance of exotic elements to the islands. JC thanks Mrs. Vanessa Briones for her work in collecting and mounting specimens for the herbarium of Juan Fernández. We also thank Ing. Mélica Muñoz and Dr. José Martínez for providing facilities to consult Santiago herbaria. Dr. Javier Figueroa and three anonymous referees made numerous valuable comments, which improved our original manuscript. This work was funded by the Proyecto de Cooperación Internacional Juan Fernández (N/BHOL/M.RR.EE/93/003) Chile- Gobierno de los Países Bajos. The paper preparation was realized with the support of a postdoctoral fellowship at the Millennium Nucleus P01-057- F of the Universidad Austral de Chile. Alcea rosea L. (Malvaceae) "Hollyhock, stockrose". Perennial herb, dispersed by gravity, native to Eastern Mediterranean. It is a very notable garden plant due to its long inflorescence, as tall as a person is. It has been considered a weed, escaped from gardens and cultivations, and naturalized in several parts of the world (Randall 2003). It is the first species of this genus on Juan Fernández islands. Although it grows inside gardens, some individuals were discovered in disturbed areas outside private properties. Specimen: RCI1, SJB, in the corner of Pasaje El Pangal with the road to the Plazoleta del Yunque, 60 m of altitude, 2.11.2002. JF 14. Two individuals seen. Amaryllis belladona L. (Amaryllidaceae) "Naked Lady Lily, Belladona Lily, azucena". Geophyte, dispersed by gravity, originating from South Africa (Danton et al. 1999). It has beautiful pink flowers and it is the first record for the family Amaryllidaceae. It is a naturalized species in Central Chile (Arroyo et al. 2000). Johow (1896) mentioned this species as an ornamental plant in RCI, but doubtlessly today it is a naturalized plant. For instance, it is very abundant in the town, forming small clusters of more than 30 cm in height. Danton et al. (1999) also found it in Puerto Inglés, this being the first citation of its presence in wild lands. We are surprised that despite the showy aspect of this species, nobody before Danton et al. had included it as an allochtonous element in floristic checklists. Even worse, the species sprouts from subterranean bulbs and blossoms during the summer, the exact time when most botanical expeditions occur. The propagation in the wild occurred a long time ago. A slide found in the photographic file of CONAF reveals that the species was already abundant in the botanical garden of the Administration office in 1984. We consider that A. belladona has one of the highest potentials to spread into the archipelago. Randall (2003) also considered it as a weed. Specimen: RCI, SJB, southward of the soccer field, near Larraín Alcalde street, 3 m of altitude, 2.11.2002. JF 17. More than 100 individuals observed. Anthemis arvensis L. (Asteraceae) "Corn chamomile, manzanilla hedionda". Annual or biennial toxical herb, anemochorous, common weed from southern Europe. Plant of medium to full light conditions. This species has been considered a noxious weed in USA and Australia (Johnston & Pickering 2001, USDA, NRCS. 2002). Matthei (1995) pointed out that this species is distributed in southern continental Chile, only between the IX and X Regions. Curiously, this is the second species of this genus reported on JF, but no evidence of the worldwide-distributed species A. cotula L. has been found. We disregard the possibility of a mistaken identification, because the material has been carefully analyzed, including the main difference between the above-mentioned species: the presence (A. arvensis) or absence of paleas (A. cotula) in the lower receptacle of flowers (Matthei 1995). Specimen: RCI, El Pangal sector (a cattle grazing prairie 2.5 km apart from the town), above the fence, 80 m of altitude, 12.10.2001. JF 24. Do not confuse with Pasaje El Pangal indicated for other species. Two individuals seen. Arctotis acaulis L. (Asteraceae) "African daisy". Perennial herb, anemochorous, originating from South African steppes. Its flowers are variable in colour. This species is already naturalized in other islands such as Japan (Randall 2003). This is the first species of the genus reported on JF. Evidently, A. acaulis is a garden plant, but it also grows profusely in borders along streets, leading us to consider it as a new addition to JF flora. Specimen: RCI, SJB, in the corner between Pasaje El Pangal with the road to the Plazoleta del Yunque, 60 m of altitude, 7.8.2002. JF 29. Ca. 50 individuals observed. Argyranthemum frutescens Sch Bip. (Asteraceae) "Marguerite daisy, Paris daisy". Perennial herb, anemochorous, native from Canary Islands. This species is catalogued as a weed by Randall (2003). It is the first reported presence of the genus on JF. We found this species growing especially in disturbed and wet sites along the borders of the Ignacio Carrera Pinto street, where the species blossoms profusely. Specimen: RCI, SJB, near the stairs descending from El Sándalo street to Ignacio Carrera Pinto street, 5 m of altitude, December 2001. JF 30, 31. Ten individuals observed. Cardamine hirsuta L. (Brassicaceae) "Hairy bittercress". Small annual herb, anemochorous, originating from Europe, where it is a common weed. It is found mostly in soils rich in mineral nitrogen. The fourth species of the genus found on JF. This species is considered as an invasive weed in the USA (USDA, NRCS 2002). It can also be considered a very aggressive invader on JF, as it is observed along the road to the Plazoleta del Yunque (a zone beyond the town area, Fig. 2). It is also frequent in the CONAF greenhouses and nursery, growing in the same sites where endemic plants are propagated. Specimen: RCI, SJB, CONAF nursery, 60 m of altitude, 7.8.2002. JF 62. Individuals in fruits observed. More than 100 individuals observed. Carduus pycnocephalus L. (Asteraceae) "Italian plumeless thistle, cardilla". Annual weed, anemochorous, native of Europe, considered also as a weed in the USA (USDA, NRCS. 2002). Plant typical of full light and warm climate conditions. This species is considered an indicator of high levels of nitrogen in soil (Ramírez et al. 1991). New genus in the flora of JF. It is very surprising that its introduction had not been noted before, as it is a well-established species in the main valleys of Robinson Crusoe where it coexists with other thistles (e.g., Puerto Inglés, Vaquería, the town area). Specimen: RCI, SJB, Vicente González street, a short distance above the police quarter, ca. 30 m of altitude, 8.21.2002. CONC 158046, JF 63. More than 100 individuals observed, some of them in bloom. Chenopodium album L. (Chenopodiaceae) "Lambs-quarters, Pigweed, quinguilla". Annual herb, anemochorous, native of Europe, considered a very serious weed, both in Chile and rest of the world (Matthei 1995, Randall 2003). Plant typical of warm climates and nitrogen-rich soils. This is the seventh addition to the genus on JF. We found the species growing along the borders of the streets, with flowers and fruits. Specimen: RCI, SJB, Vicente González street, outside the police quarter, 30 m of altitude, 7.8.2002. JF 73. Three individuals seen. Erodium moschatum (L.) LHér. ex Aiton (Geraniaceae) "Whitestem filaree, alfilerillo". Annual herb, epizoochorous, a common weed from Mediterranean Europe (Randall 2003). It is a good species for forage (Hoffmann 1995). It is the second species reported for the genus on JF. An evident difference with the other species of this genus (E. cicutarium (L.) LHér. ex Aiton) is the presence of mericarps with glands in E. moschatum (Matthei 1995). The species can be found in the town, in El Pangal and in Quebrada Piedra Agujereada (outside of CONAFs shelter), while E. cicutarium predominates in Puerto Francés. We consider both species fully naturalized. Specimen: RCI, El Pangal sector, to the side of the road, 50 m of altitude, 8.13.2002. CONC 158067, JF 113. More than 100 individuals observed. Euphorbia helioscopia L. (Euphorbiaceae) "Sun spurge, wartweed, pichoga, lechetrenza". Annual monoecious herb, dispersed by gravity or wind, native to the temperate regions of Eurasia. It is a common and toxic weed in several countries (Holm et al. 1997). The species is found mostly in soils with a high content of mineral nitrogen. It is the third addition to the genus on JF. We think that the species has a good potential for propagation, as it produces abundant flowers, fruits and seeds, and during the period 1999-2002, range expansions were observed in several places in the town. As it reaches more than 30 cm in height, its presence is easily noticed. We recommend strict attention to this species, and ideally, its eradication. Specimen: RCI, SJB, between Dresden School and soccer field (nearer from this), 3 m of altitude, 7.25.2002. CONC 158065, JF 186. Ten individuals seen. Freesia refracta (Jacq.) Klatt (Iridaceae) "Freesia, Fresia". A perennial herb that reproduces and disperses vegetatively, native to South Africa. It attracts attention as an ornamental plant due to its fragrant and showy white-yellow flowers. Randall (2003) catalogued this species as a weed, escaped from gardens. The presence of Freesia adds a new genus to the JF flora. It was observed forming dense clusters just outside the fence of an islanders garden. Specimen: RCI, SJB, Teniente Cortés street, in the outside of Angulo familys property, 20 m of altitude, 7.19.2002. JF 846. Ten individuals seen. Lathyrus odoratus L. (Fabaceae) "Sweet pea, tuoksuherne". Perennial herb, dispersed by gravity, native from Sicily, Italy. It is a naturalized weed, escaped from cultivation (Randall 2003). First record for the genus on JF. Although it is mainly confined to private gardens, individuals in flower growing in disturbed sites outside houses have been observed. Specimen: RCI, SJB, near El Palillo picnic area, 5 m of altitude, 11.16. 2001. JF 164-166. Five individuals observed. Leucojum vernum L. (Amaryllidaceae) "Spring Snowflake". Geophyte that reproduces and disperses vegetatively, native from Central and Western Europe. It inhabits moist soils, being a nitrogen indicator (Ellenberg 1974). It is the second species for the family Amaryllidaceae on JF, and the first for the genus. Randall (2003) considered it a naturalized weed that had escaped from cultures in USA and Finland. On JF, it was introduced as a garden plant and now has also escaped from cultivation. It was also found in the Botanical Garden of CONAF during the year 2002, but the species had not been planted by humans. It seems to be propagating with celerity, given its increased density over a short time period. Specimen: RCI, SJB, CONAF Botanical Garden, 60 m of altitude, 7.8.2002. JF 16. Ten individuals observed, some of them in flower. .
Lobularia maritima (L.) A.N. Desv. (Brassicaceae) "Sweet alyssum, Carpet of snow ". Perennial herb, myrmechorous, native of Europe, used as ornamental plant on JF due to its numerous and small white flowers. New genus to the JF flora. According to Randall (2003), this species is considered a weed in many countries. We believe that the species has a great potential to propagate itself, given its wide distribution across the town. Specimen: RCI, SJB, Larraín Alcalde street, outside from the Municipality, 4 m of altitude, 2.11.2002. CONC 158047, JF 172. Fifty individuals observed. Mentha suaveolens Ehrh. (Lamiaceae) "Apple mint, Round-leaved mint, menta". Perennial herb, dispersed vegetatively in JF, native of Europe, considered a weed in several countries (Randall 2003), and utilized as a medicinal plant. It is the third species of the genus cited on JF. The only individuals observed were adjacent to a CONAF workshop, in a very disturbed site below shambles. No flowers or fruits were detected, but the species can reproduce vegetatively through stolons (Matthei 1995). The persistence in the same site during the period 2001-2002 suggests that the species can also persist in the future. Specimen: RCI, SJB, outside of CONAF workshop adjacent to the laboratory, 60 m of altitude, October 2001. JF 198, 199. Three individuals seen. Oxalis pes-caprae L. (Oxalidaceae) "Bermuda buttercup, soursob, sour grass, vinagrillo". It is a geophyte with vegetative dispersal, native to the Cape Region of South Africa, and has been catalogued as a noxious weed in other places, particularly in Mediterranean-type climate zones (Randall 2003). In many cases, it has escaped from cultivation and gardens. It is the third species reported for the genus on JF. The species blossoms during winter, and groups of plants with numerous individuals were observed in several parts of the town. As the species also reproduces through its numerous bulbs and bulblets, it has a great potential to propagate. Specimen: RCI, SJB, Ignacio Carrera Pinto street, outside of Luis Petersens house, 2 m of altitude, 7.8.2002. CONC 158051, JF 219-220. ca. 50 individuals observed. Oxalis purpurea L. (Oxalidaceae) "Purple oxalis, purple woodsorrel, four oclock". Perennial herb that reproduces vegetatively, native to South Africa. The flowers are pink and the leaflets are almost circular, with many scales, while the above-mentioned Oxalis has obcordate, glabrous leaflets and yellow flowers. It is the fourth species reported for the genus on JF. It has escaped from gardens and cultivations (Randall 2003). It has been seen in the wild in Western Australia where it is considered a weed, like other Oxalis species (Randall 2003). Numerous individuals were observed in the specimen locality of collection, and therefore we think the species has the potential to spread in the future. Specimen: RCI, SJB, Ignacio Carrera Pinto street very near to the intersection with Larraín Alcalde street, 2 m of altitude, 7.8.2002. CONC 158044, JF 221-222. More than 100 individuals observed. Parietaria judaica L. (Urticaceae) "Pellitory-of-the-Wall, spreading pellitory, sticky weed". Perennial herb (Ellenberg 1974), epizoo- and hydrochorous dispersal, native of the Mediterranean region, typical of warm climates, and moist and nitrogen-rich soils. This is the second species of the genus found on JF. We found several individuals outside of a house, and evidently they were not planted there: the species does not show a preference for cultivation in gardens. Its abundant flowers and fruits suggest that the species can easily propagate. For continental Chile, P. judaica was reported by Rojas (1999) from Valparaíso and Santiago. This species has been classified by the Noxious Weeds Act (1993) as a W3 weed in Australia, meaning that its spread must be prevented and its numbers and distribution should be reduced. Specimen: RCI, SJB, La Pólvora street, outside of Robinson Crusoe Air Transports, 10 m of altitude, 7.23.2002. CONC 158070, JF 327. Five individuals observed. Pelargonium peltatum (L.) LHér. ex Aiton (Geraniaceae) "Ivy geranium, Austrian geranium, cardenal". Shrub native of South Africa. This species, which has pink flowers, it is considered as a weed escaped from gardens and cultivations by Randall (2003). The second taxon of the genus on JF (the other is the hybrid P. x asperum Willd., Swenson et al. 1997). Specimen: RCI, SJB, Ignacio Carrera Pinto street, near the house of Alfonso Andaurs father, 2 m of altitude, 10.5.2001. JF 229, 230. Five individuals seen. Pinus pinaster Aiton (Pinaceae) "Cluster pine, Maritime pine, pino marítimo". Tree, anemochorous, native to Mediterranean Europe. It grows on loose sandy soils, being resistant to droughts and frosts (Rodríguez & Quezada 1995). Johow (1893) mentioned this species, but he omitted it in his flora published in 1896. Probably he changed his mind and considered the pines inhabiting RCI as Pinus insignis (today P. radiata D. Don, Swenson et al. 1997). However, P. pinaster was found as a low-abundance tree, in comparison with P. radiata that grows profusely in the forest plantations. The main differences between the species are the verticiles, with two opaque needles in P. pinaster and three brilliant ones in P. radiata; moreover, the leaves of this species are very thin and flexible in comparison to P. pinaster (Rodríguez & Quezada 1995). As the individuals produce cones and seeds and they are not preferred for cutting, their range expansion in the future seems possible. Randall (2003) also considered it a noxious weed, escaped from garden cultures. Specimen: RCI, between El Palillo picnic area and the road to El Pangal, 60 m of altitude, 8.10.2001. JF 237. Ten individuals observed. Solanum nigrum L. (Solanaceae) "Black nightshade, hierba mora". Annual herb, endozoochorous dispersal, native of Europe, toxical, cosmopolitan. It is an indicator of nitrogen-rich soils (Ramírez et al. 1991). This is the eighth species reported for the genus on JF, most of them have been introduced. Few individuals were observed in rural areas. The specimens found had flowers and fruits with seeds, suggesting that the propagation of this species may be very fast. Its fleshy fruits attract ones attention because, as has occurred with other plant plagues such as Aristotelia chilensis (Molina) Stuntz, Rubus ulmifolius Schott and Ugni molinae Turcz., they may become dispersed by birds, especially Turdus falcklandii magellanicus (Cuevas & van Leersum 2001). Moreover, Matthei (1995) pointed out that it is a very serious weed in continental Chile. It is also recognized as a noxious weed and escaped from garden and cultures elsewhere (Randall 2003). Specimen: RCI, in the road to the Plazoleta del Yunque, not far from La Quinta, ca. 90 m of altitude, 3.5.2002. CONC 158068, JF 303. Two individuals seen. Sonchus asper (L.) J. Hill (Asteraceae) "Spiny sowthistle, prickly sow-thistle, ñilhue caballuno". Annual or biennial herb, anemochorous dispersal, native to Europe. It is a plant typical of medium to full light conditions, warm climates and nitrogen-rich soils. It is a noxious weed, introduced and naturalized by man, worldwide spread (Randall 2003). This is not a new introduction. Johow (1896) mentioned this species as S. fallax Wallr. (a synonym, Matthei 1995). However, Skottsberg (1922) claimed that there was an error of identification, as he only found S. oleraceus L. Much later, S. asper appeared again in an unpublished list by C. Marticorena in 1983, later cited by Ricci (1990, 1992). Unfortunately, we could not verify Johows identification, due to the absence of specimens in the depositories of Johows collections (SGO and Universidad Metropolitana de Ciencias de la Educación, Santiago). In either case, we confirm the present existence of S. asper in RCI, being the third species of the genus described in the archipelago (the other ones are the already mentioned S. oleraceus and S. tenerrimus L.). S. asper is clearly differentiable from the former because it has very fleshy and spiny leaves, and by its strongly flattened (elliptical to broadly oblanceolate) achenes with short wings (Matthei 1995). S. asper can be found alongside the road to the Plazoleta del Yunque, in the Plazoleta itself, in Vaquería and in Puerto Inglés. Clearly, it is a very well established species on RCI. Specimen: RCI, Plazoleta del Yunque, 1 km in straight-line southwest from the town but 250 m of altitude, 2.15.2002. CONC 158045, JF 307. Ca. twenty individuals observed. Tanacetum parthenium (L.) Sch. Bip. (Asteraceae) "Feverfew, altamisa". Perennial herb, anemochorous, native to Southeast Europe, cultivated as medicinal and ornamental plant. It has a strong smell. Johow (1896) also mentioned it as ornamental for JF, under the name Pyrethrum parthenium (L.) Sm. It is the first species of the genus found on JF. Tanacetum has little importance as a weed (Matthei 1995), but Randall (2003) considered it as a naturalized weed, escaped from cultures. Specimen: RCI, SJB, Larraín Alcalde street, outside of La Brújula Discoteque, 4 m of altitude, 7.8.2002. CONC 158063, JF 81. Three individuals observed, some of them in flower. Taraxacum officinale Weber ex F.H.Wigg. (Asteraceae) "Common dandelion, diente de león". Perennial herb, anemochorous, native to Europe, edible and medicinal plant, distributed in almost every temperate and subtropical region of the world (Holm et al. 1997). It is also recognized as an important weed, escaped from gardens and noxious (Randall 2003). It grows in prairies, disturbed sites, streets and roads (Matthei 1995). It is found in intermediate to full light conditions and in soils rich in nitrogen (Ramírez et al. 1991). We are very surprised that it had not been reported previously for the archipelago, where two other native species of Taraxacum exist. Evidently, on JF it is not a cultivated species. Hoffmann (1995) (but not Matthei 1995) pointed out that the V Region in mainland Chile is within the species range. Specimen: RCI, SJB, Dresden street, outside from the Evangelical Oration House, 3 m of altitude, 2.25.2002. CONC 158055, JF 315. Ten individuals observed, some of them with flowers or seeds. Tradescantia fluminensis Vell. (Commelinaceae) "Small-leaf spiderwort, white-flowered wandering jew". Perennial herb, dispersed vegetatively, native to Tropical Americas (Brazil). The first species of the genus and family on JF. The location of the finding is La Falda, a forested site that was inhabited in the past, but presently is outside of the urban area. La Falda is near a picnic site frequently visited by the islanders. The species was not found in other places, and the rate of range expansion seems very limited. Individuals without flowers observed, but the species is known to reproduce vegetatively in other places (Roy et al. 2004). Species catalogued as weed, introduced and naturalized in some places (Randall 2003). Specimen: RCI, La Falda, near an abandoned house, ~90 m of altitude, 7.25.2002. JF 845. Two individuals seen. Trifolium glomeratum L. (Fabaceae) "Flat headed clover, clustered clover". Annual herb, anemochorous, coming from the Mediterranean area and west Asia. It is recognized as a weed and casual alien (Randall 2003). The fifth species for the genus found on JF. We only observed it in El Pangal. This area is designated for cattle and horse raising, which are occasionally fed with introduced grass bundles. This may explain the existence of three new introduced species in this area (Anthemis arvensis, Erodium moschatum, and this one). Specimen: RCI, El Pangal sector, above the fence, 80 m of altitude, 12.10.2001. JF 320. Two individuals in flower observed. Viola odorata L. (Violaceae) "Sweet violet, violeta". Perennial herb, myrmechorous, coming from Eurasia. Johow (1896) recognized it as an ornamental plant. Viola is a naturalized weed species, escaped from gardens and cultivations (Randall 2003). It is the first species for the genus and family on JF. Specimen: RCI, SJB, near the intersection of Teniente Cortés and Ignacio Carrera Pinto streets, 5 m of altitude, 7.8.2002. JF 338. Five individuals observed, some of them in bloom. 1 Abbreviations: RCI = Robinson Crusoe Island; SJB = San Juan Bautista; JF = Juan Fernández Islands.